This is a Gear Motor w/Encoder, model No.GB37Y3530-12V-90EN. It is a powerful 12V motor with a 90:1 metal gearbox and an integrated quadrature encoder that provides a resolution of 64 counts per revolution of the motor shaft, which corresponds to 5756 counts per revolution of the gearbox’s output shaft. These units have a 0.61" long, 6 mm-diameter D- shaped output shaft. This motor is intended for use at 12V, though the motor can begin rotating at voltages as low as 1V. The face plate has six mounting holes evenly spaced around the outer edge threaded for M3 screws. These mounting holes form a regular hexagon and the centers of neighboring holes are 15.5 mm apart. This motor is an ideal option for your mobile robot project. For example,with arduino UNO board, you want to use interrupt port 0(int.0). You should connect digital pin 2 with the board. So, the following code is only used in UNO and Mega2560. If you want to use arduino Leonardo or Romeo, you should change digital pin 3 instead of digital pin 2. 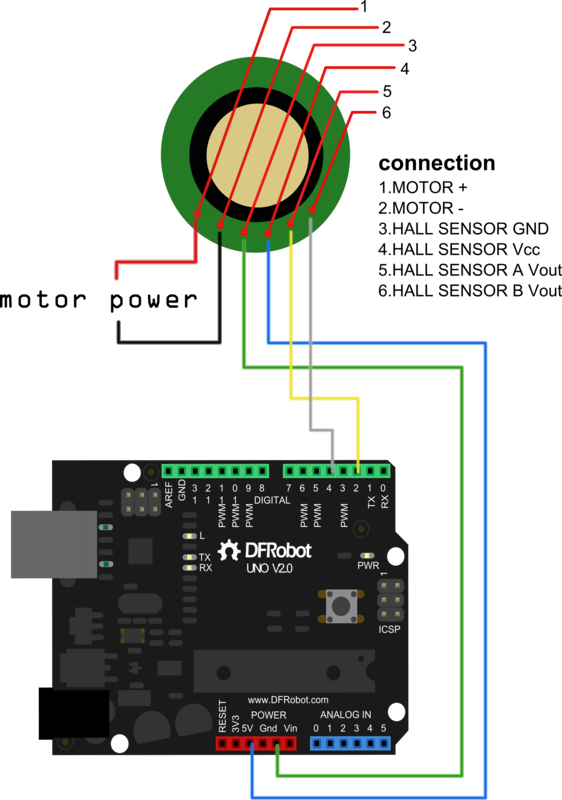 Get 12V DC Motor 122rpm w/Encoder from DFRobot Store or DFRobot Distributor.